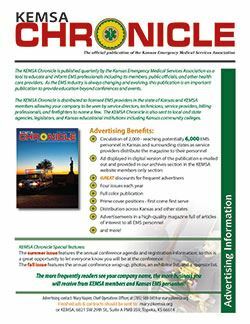 The KEMSA Chronicle magazine gives you an opportunity to promote your products or services in a high quality full-color publication to potentially 10,000 EMS professionals in Kansas and beyond, including: more than 110 EMS services; more than 1,650 individual members including service directors, technicians, service providers, firefighters and more; plus legislators, community colleges, and other local and state agencies. 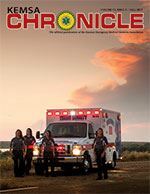 The KEMSA Chronicle magazine is published quarterly by the Kansas Emergency Medical Services Association as a tool to educate and inform EMS professionals including its members, public officials, and other health care providers. As the EMS industry is always changing and evolving, this publication is an important publication to provide education beyond conferences and events. Discounted advertising rates are available for frequent advertisers, and prime advertising positions are given on a first come first serve basis with a four-issue contract. Download the advertising media kit here. The media kit includes information about the magazine, a rate sheet, ad dimensions, and an advertising contract. Finished ads should be submitted by e-mail as a 300 dpi PDF ready for output. Ads may also be submitted as EPS, JPEG or TIFF files ready for output. All graphics should be high resolution, created, and stored at 300 dpi for the highest quality when printed. If you have any questions regarding advertising in the KEMSA Chronicle or want to take advantage of this opportunity, please contact Mary Napier, KEMSA COO, by e-mail mary@kemsa.org or call her at (785) 580-3459.